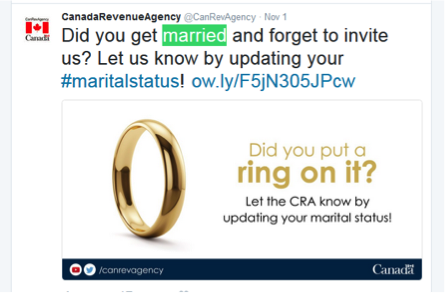 It was interesting to see that the Canada Revenue Agency (CRA) tweeted, “Did you get married and forget to invite us?,” on twitter. It is such a common thing for people not to update their marital status with the CRA, especially when the wedding and getting married sometimes makes us way too busy already. However, it is very important for everyone to inform CRA of their marital change as early as possible. Marital status change directly impacts many of your benefits and credits, which are determined by the household income, number of children, and the province(s) where you and your family live. If you get married, or are now considered to be living common law, and you or your new spouse, or common-law partner, has children who live with you, the CRA will put all of the children on the female parent’s account, and the amount of the benefits might also be changed. To continue getting the Child Canada Benefit (CCB), you must file an income tax and benefit return every year, even if you did not have income in the year. If you have a spouse or common-law partner, they also have to file a return each year. If you are married, or are considered to be living common-law, only one of you can receive the GST/HST credit. The CRA will pay the credit to the person whose return it assesses first. If you become separated, widowed or divorced, the CRA will determine your eligibility and tell you if you are entitled to receive the GST/HST credit. If your marital status changes, you will need to submit a new working income tax benefit advance payments application. If you do not submit a new application, your advance payments will stop until the CRA receives a new application.